The Cooneyite "Dippers" or "Tramp Preachers" have just opened a Convention at Crocknacrieve, the residence of Mr. John West, near Enniskillen. This is a "record" assembly, as delegates come from all parts of the world, and elaborate preparations have been made for housing them and providing food supplies. The proceedings are to last six weeks, and during that time it is calculated 10,000 adherents will participate. Mr. Wm. Irvin the founder of the sect, is in attendance and Mr. Edmund Cooney, his chief Lieutenant, is returning from Canada to take part in the deliberations. TTT NOTE: The above quote is also found in a longer article printed in the The Nenagh Guardian, page 6 on July 9, 1910. ADDRESS BY MR. GEO. WALKER. Crocknacrieve, the residence of Mr. John West, situate about four miles from Enniskillen, is again this year the centre of religious activity. The great annual convention of the Tramp Preachers opened there on Sunday. For some weeks past a large party have been making preparations for the reception of their brethren, this year’s convention eclipsing in anticipation all former conventions. Delegates will attend from all parts of the world, and before the convention close, over 10,000 pilgrims it is estimated will visit Crocknacrieve. Mr. Wm. Irwin, the leader and originator of ‘the work’ is there at present, also Mr. Geo. Walker, but Mr. Edward Cooney is, we are told, on his way, having left Canada last week. At present there are about 300 members of the sect accommodated at Crocknacrieve, a number of marquees and huts having been erected on the grounds for sleeping purposes, while about 50 of the men are put up at Mullaghmeen. Sunday’s proceedings opened as usual with a ‘testimony’ meeting, at which Mr. Wm. Irwin and others spoke. The meeting was confined exclusively to those in the fellowship, and no outsiders were present. The next meeting was timed to commence at three in the afternoon, when the spacious tent was about half filled. John Kelly and Geo. Walker were the only occupants of the platform. The meeting was subsequently addressed by a couple of sisters and a young man from Philadelphia called ‘Jack’ by his comrades. The speaker was of a conspicuously milder tone than is generally characteristic of the afternoon meetings, the speakers one and all confining themselves for the most part to speaking the simple gospel and expressing their thankfulness to God for leading them out of the ways of the ‘false religions’ into the ‘true’ way. The big gun of the evening, however, was Mr. Geo. Walker, a former resident in the Ballinamallard district. Prefacing his remarks by reading part of the 12th chapter of Acts, describing St. Paul’s visit to Athens, the speaker went on to say that the greatest crime in the world from the standpoint of religious people was to look into the Bible and begin to judge men and women by it. Some people say to him ‘Do you believe that all these good men that have lived before us, and our forefathers are gone to hell? Well, what’s far harder for them to believe is that Jesus is wrong, nay, rather believe that Jesus is right, and every other man wrong. Every nation in the world has the unregenerated idea that God lives in a temple or building, or house, where they can go once or twice a week and worship Him. ‘What a lonely place for Him to stay in!’ ‘How would you like,’ he asked, ‘to stay here from one Sunday to another.’ That was a curious idea of God. Paul says ‘He dwells not in temples made with hands.’ You take your religion to church with you in your Sunday clothes and leave it behind you with the hymn book as some people do, instead of bringing God with them every day. It may do very well now to go once or twice a week to church and be sanctimonious, to say prayers and sing hymns, but it will not always do. It is the foundation of the devil’s false religion. This place is not a recruiting station for getting people to join us, but we want them to get to know Him. If you join us 70 times over, he added, and don’t know Him you will go to hell. Don’t think that because you come here you will go to heaven. What a silly fool the devil makes of you by telling you such things. The greatest crime one can commit today is to tell another that they are going to hell. Hell is the place for you if you don’t get to know God here. If you give him a home in your heart He will give you a home in heaven. Continuing, the speaker said he used to think he was religious when he was flattered in Enniskillen when collecting a shilling for foreign missions when a boy, as he went about asking contributions and getting a shilling from people who didn’t care anything for foreign missions, but who thought it made them religious when they were praised for giving something and they then thought they were doing God’s service. That was contrary to what Jesus said, and people go to hell under the delusion that they are doing something for God. In every country in the world we find people living this shallow superficial life, but there are always a few who embrace the truth. I remember quite well when I was 11 years of age going down to the church in the village there (meaning Ballinamallard) and going and kneeling at the penitent form, for I was anxious to get converted as ever anybody was. I wanted to be a christian. I remember kneeling there and seeking to get converted, as that was all I heard about it. I was told I was converted there, but though only 11 years old I remember having a clear feeling that I had got nothing at all. I was told and taught after that I was a Christian, but I knew nothing about it. I remember after that going from Enniskillen to Garvary Church three miles distant. I longed to know that I was a Christian. I yearned after it, as I did not want to live the shallow superficial life that I saw around me. There seemed to be some change made on me then, but I could not get away from the Scripture which says ‘Deny yourself and take up the cross and follow Me.’ I was led to measure myself by other people and to soothe my conscience. I went to sleep saying ‘I am as good as other people and surely they all can’t be wrong.’ I anxiously tried to be a Christian, but could not do so for covetousness, selfishness, and worldliness, and I knew that so long as I was possessed of that spirit I could not go to heaven. PLAYING INTO THE DEVIL’S HANDS. I went on that way till I was 21 and the only way I thought I was a Christian was by playing into the devil’s hands and measuring myself by other people. the wonder was that I ever could have been such a fool as to think I was a Christian in face of what God tells me. As I look around this district and see the impression left by the religious people of the day I am very glad that ever the Lord pointed out to me and enabled me to walk the Jesus way. The devil is deluding people into his way of worshipping God in a house, sitting there, singing hymns and going through a pretence of religion, but such will never satisfy an honest heart. Tea was provided after the meeting. The closing meeting commenced at 7 o’clock when a number of addresses were delivered. Crocknacrieve, near Ballinamallard, Co. Fermanagh this week resembles an army camp. Over one thousand “Cooneyites” from all parts of Ireland and from England and Scotland, have assembled to hold their annual Convention, and delegates from New Zealand, Australia, America and Canada are expected to arrive in a few days. The owner of Crocknacrieve House, Mr. John West is an enthusiastic member of the sect, and for the next three weeks the “Pilgrims” will have possession of the buildings and the extensive grounds. Over two hundred persons are being accommodated in the dwelling house, and bedsteads have been placed in the out offices and in two large sheds for the female pilgrims, while male members of the sect sleep in tents which have been erected on the lawn. An old wine cellar has been ___up as a ___ and here bakers turn out hundreds of ___leaves. Carcasses of meat are being brought from Belfast and other places and “Pilgrims” skilled in the art of butter-making are busy all day in a dairy, where a ____ is in use. Almost all the “Pilgrims,” male and female, ride bicycles, and a big shed has been provided for storing their machines. The male members can be easily recognized along the roads and in the adjoining villages by their unshaven beards and their rubber collars. Nearly all the “sisters” wear black dresses and plain sailor hats. Services are held daily and the principal preacher is Mr. Wm. Irvine, one of the founders of the sect, who was formerly an engineer in Scotland. Mr. Edward Cooney, the son of a wealthy Fermanagh merchant, who joined the sect some years ago, and who for the past four months has been preaching the ___ doctrine in Canada, is expected to arrive at Crocknacrieve before the convention closes. At each service two or three members of the sect relate the story of their “conversion” and renounce their former religious associations. The “Pilgrims do not believe in any of the Christian churches and at the principal meetings clergymen of all denominations are vigorously denounced. They declare that no one can be saved who drinks or smokes. Before a person is admitted into the sect he or she is publicly immersed in a running stream. The "Cooneyite Dippers" have just opened a Convention at Crocknacrieve, the residence of Mr. John West, near Enniskillen. This is a "record" assembly, as delegates come from all parts of the world and elaborate preparations are being made for housing them and providing for food supplies. Mr. Wm. Irvin (Irvine) the founder of the sect, is in attendance, and Mr. Edmund [Edward] Cooney, his chief lieutenant, is returning from Canada to take part in the deliberations. The annual convention of the Pilgrims or Tramp preachers was continued at Crocknacrieve on Sunday last. Disappointment was felt at the absence of Mr. Edward Cooney, who was expected to arrive on the Saturday. Last Sunday’s proceedings commenced with what they call a testimony meeting. At the afternoon meeting a ‘brother’ declared that they did not believe in Bunyan’s ‘Pilgrim’s Progress,’ and, proceeding, he laid emphasis on an instance in that book which, he said, resembled most people of the present day, who were so blinded by the devil’s false way as to clamour after the popular religion and false doctrines instead of allowing themselves to be led into the true way. Continuing, he referred to an uncle Robert, who he said, had been a great worldling, and lived for the world, and when he was about 40 years old and settled down in the world he was taken away out of the world into eternity without God, and his (the speaker’s) mother used to sit and cry and say she feared her brother had not gone to heaven. If Jesus were on earth again tomorrow He would be a Tramp Preacher as He never was a paid preacher, nor, never believed in them. He did not sprinkle babies nor carry on the work of the false preachers. This was what the Holy Spirit meant when he mentions so often all through the Bible of the way of darkness, ‘Darkness of the face of the deep.’ The more education and learning, the more darkness. They look to themselves and reassure themselves by one another instead of looking to the Man Christ Jesus. God made the sun to rule the day and the moon to rule the night, and so God’s true way rules the day and the devil’s false ‘way’ rules the darkness. People in their unregenerate form try to make themselves look better. They may paint their faces, and wear a lot of jewellery but they cannot make themselves look better in God’s sight. The red Indians wear high feathers in their hats, the Chinese wear jewellery on their ankles, and in other countries they wear rings in their noses to make themselves look better, but in their unregenerate form they cannot for God measures them by His spotless Son. He remembered when he was being. of these preachers and I would have been there along with them if my eyes had not been opened to God’s true way. I longed and was anxious to become a Methodist preacher, and I would be one tomorrow if I could see one way of hope in the Bible that I could ever get to heaven. Can you put the life of Jesus into a clergyman’s life? because they had been shown the better and truer way. They had been led to know that God could not be worshipped in a building or with men’s hands. The idea of God dwelling in a building made with men’s hands! Rome leads the way with its large buildings for the purpose of worshipping God, and then the Episcopalians follow suit, the Presbyterians erect their buildings, and the Methodists erect theirs, and so the false doctrine of God worshipped in a building is carried on. The clergy screw the last penny out of you to build a house for the worship of God, and then you are led to believe that you are working for God. They are like the clergy of Jesus’ time who put burdens on men’s shoulders which they are not able to bear. You cannot be a believer in any denomination and be a believer in Jesus, for Jesus belonged to no denomination. He knew perfectly well that the clergy did not watch for their souls, as it was all a money making business with them. No man believing in Jesus can believe in a paid clergy, paid to tell you lies and keep back the truth. Don’t believe, however, that because you join us you are saved. We might ask you to profess to be saved, and yet you could go to hell. Being saved means right about face, turning your back on that which leads you wrong. THE MAIN hall or tent of the Pilgrims at Crocknacrieve is lit up by means of electricity this year. The convention of ‘tramp preachers’ at Crocknacrieve, near Enniskillen, has exceeded all expectations. Each day brings fresh arrivals to swell the large concourse, and on Sunday last the large tent, which was added to this year, was incapable of holding all who wished to enter it, and during the services many had to remain outside. Some idea of the number attending this convention and the remarkable arrangements made for the feeding of the hundreds who visit Crocknacrieve, may be gleaned from the fact that on Sunday last no fewer than 1,150 dinners and the same number of teas were served. Mr. Edward Cooney had not arrived on Sunday much to the disappointment of all, but on Monday, his cheery face was welcomed heartily by all the ‘tramps.’ He spoke at the evening meeting on Monday. Earlier in the day seven new converts were baptised. So up-to-date are the arrangements that the large tent is now lit at night by electricity. Mr. Wm. Irwin the recognised ‘leader’ spoke at the testimony meeting on Sunday morning, but up to the present he has followed the course he adopted throughout the convention last year of absenting himself from the Sunday afternoon meetings. The afternoon meeting commenced shortly before four o’clock. On the platform were seated—Messrs. John Kelly, Willie Gill, and George Walker. The first speaker was a Miss Irwin, formerly belonging to the Augher district, of Co. Tyrone, who told how she got saved by the ‘Jesus way’ some seven years ago, and led to see that the clergy way was wrong. The meeting was afterwards addressed by a couple of ‘brothers’ who from the line of speaking pursued, seemed to have a fairly good knowledge of the conditions of life existing in most countries in the world. They told of conversations they had with different preachers of the gospel, differing from them in their way, all of whom admitted, according to the speakers, that the ‘Jesus way’ was the right way, but complained that it was a very difficult way and they elected to take the easy way and have the popular life and smile of the world. One of the speaker’s father was an elder in the Presbyterian Church, and the speaker was consequently a member of that church, having been converted when he was 16 years of age. He used to be very fond of teaching in the Sunday school, and preaching a little too, but all the time he was doing the Devil’s work under the cloak of religion, sympathising with the way of the clergy which was contrary to the way of Jesus. God had a law in nature for carrying out all his plans. There was no new way of bringing babies into the world. The sun, and moon and stars had no new way of going their course, and so it was in the spiritual world. The closing address was delivered by Mr. Geo. Walker, who declared that it was not because they (the tramps) were well educated that they followed in the way of Jesus, but because they saw it was the right way and they were willing to bow the knee to it, whether they were rich or poor, learned or unlearned, they did not allow their pride to have the mastery over them, but they submitted to the way that God had taught them to be right, and had rejected, and turned their backs on the way of the clergy which they had found to be false and of the devil. Do you think, said Mr. Walker, that all these multitudes of people will be lost and that only a few will be saved. His only answer to that was that wherever God finds a true and honest heart to respond to his truth He will come unto that heart and make His abode there. So long as that little word is spelt with only three letters F.e.w, it will only be the few that will be saved. Paul was an educated man but he did not allow his high education to allow his pride to be abased and to prevent him coming down and bowing his knee to the way of Jesus, but he rather made use of his education in the promotion of the cause of Jesus. It is not necessary for any one of us to go to college to be able to walk in the way of Jesus or to teach that way. Jesus nor his followers never went to college. That is the way of the Devil. The word says: ‘A wayfaring man though a fool may not err therein, whoever runs may read.’ So that it is within the reach of everyone whether learned or unlearned, who cares to stop and read and think of these things. Tea was subsequently partaken of and the evening meeting commenced about seven o’clock. At a certain gateway some four miles from Enniskillen there were signs of a concourse of people, many ruts of cars, bicycle tracks, and innumerable foot prints, all thus plainly discernible on the ground soft from the recent rain. Up the avenue that led from the gate there were further evidences of traffic—discarded cycles, groups of people under the trees, walking couples of two or more, and a general feeling of stir withal. This is Crocknacrieve, the present meeting place of the Pilgrims or Tramp Preachers. A man stands at a cross way and directs the males one side and females the other, and thus do the folk proceed till the tent is reached—a large erection just beside the house. 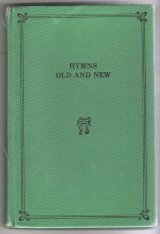 Once having entered, seats are shown and hymn books are distributed, these latter a small selection from ‘Songs of Victory,’ of considerable popularity at evangelistic meetings. The surroundings are unusual, and therefore of note. Some one thousand people are present, the sexes sitting at different sides; and upon a raised platform with a high background of boards sit four or five men. The tent covering is of white canvas, well cared, and ventilated; everywhere signs of competent workmanship were evident. All was neatness and in order. Seats and tables were arranged, the latter having a cover of white oilcloth, and at these sat the members of this strange community and all and sundry who came to listen to them. For such a large gathering the silence was impressive. There was a short prayer delivered by Mr. Edward Cooney in his sonorous voice. He was looking the better of his trips to Canada, at least outwardly a healthier and more braced effect is his. He is one of those on the platform. Three women in succession speak. The first one has a stirring Scotch accent, and the last a Yankee twang. None of the three said anything about the work they were doing, the mode of progress, field of labor difference or difficulties experienced in various places, or in fact anything of an interesting nature. They each gave certain symptoms of a before and after nature, and the intermediary stage was ‘getting saved.’ There was much talk of ‘cravings,’ ‘yearnings,’ being unsatisfied, troubled conscience longings for rest &c., &c. Less beef and a long walk daily, coupled with an interesting hobby of some sort, would have cured all this—but no, much more experience and emotion, and a change is effected. This in what is termed being ‘regenerated.’ No attempt is made to help or show others how this interesting event may or can take place, no text quoted as backing up the reason of it, nor any question of love towards one’s fellow men mentioned. These ladies spoke, if one may so term it, from a very low standard. It was a paying game to get saved, to fix it up all right for Eternity. This life evidently was of little importance except as the merest foothold for the next; in fact, ‘twas almost a loss to live, one would think, to hear them. The doctrines of love to one’s neighbour, feelings of kindliness or charity, steps toward strengthening moral character, were not touched upon. In the sense of preaching the ‘gospel’ they did not excel. Their words, which were many, became very monotonous, and in not any case was a full stop at the end of a sentence made. They rattled away without pause. The inference given was, that they were accustomed to speak at places where, if they stopped for one moment, some one would interrupt or stop them, or some impertinent remark be made. For this reason what they said was without effect. Hymns were sung between the speeches of these three ladies and the three men that followed. It was remarkable that though such a large number of people sang together without any controlling force of any kind, they kept wonderfully in time, and their singing was brisk and evidently enjoyed by the majority. A solo which was sung by a female member of the band, and was taken up in the chorus, had little merit. The three men’s speeches were something similar to those of the women. That two of them had been to America was learned from a few casual words. Strong emphasis was laid on the fact that one need not have been to college or school in order to be saved. This seems rather unnecessary, as no one puts forward such a statement. The clergy came in for severe condemnation. With these people rather a peculiar view is held. You are either all right or all wrong. An ordinary man in the ordinary run of life, trying to live up to the best he knows, might as well not try according to them, if he is not ‘regenerated.’ Whether he attends a public house or church in the morning, beats his wife or cherishes her, is quite immaterial; his doom is sealed either way, and damnation sure. No turning over of new leaves or steps in the right direction are of any avail with them; it is Heaven or Hell straight. Various diseases have attended odd symptoms, and with this craze about being saved, assurance is very strong. Those in consumption always imagine they will get better, those who have lost members of the body continually feel them: with the Pilgrims comes a certainty and confidence that their names are enrolled in the Book of Life, but grave doubts are entertained of anyone else’s being there. Mr. George Walker, who used to be a draper’s apprentice in Mr. W. R. Cooney’s employment, spoke last. He has a good speaking voice, but he strained it so much, quite unnecessarily, that it became quite rasping and therefore unpleasant to the ear. A convention in the usual way is regarded as an opportunity for members of any society to meet, to discuss affairs financially and socially, arrange campaigns, and settle various points. In this respect this convention at Crocknacrieve is hardly properly termed, as, except they do this sort of thing in committee, it is not done at all. One would imagine that late converts would be instructed, young workers helped by those of more experience, and certain lines of procedure laid down for missionaries. It would be quite impossible for a stranger hearing such speeches as those already referred to, to gain any idea of the views held by the Pilgrims. Those who live in this district know that they believe in adult baptism, no paid clergy, a common purse, no wedding ring, no adornment of the body, and, in as far as is compatible with modern day life, to live as Jesus did. As soon as the speakers were finished a small brigade of men, short-sleeved and aproned, appeared with huge cauldrons of tea, and very quickly each person present was provided with a mug of tea and bread and butter. All who were present at this meeting were hospitality entertained, and the ‘Marthas’ of the flock were most attentive. There was little ceremony about the meal; a grace was sung (by those who were not talking or eating), and in ten minutes or so the vessels were cleared off the table, the tent emptied, and washing and clearing operations commenced. Every one seemed to have something to do, and they did it. The last Convention of the Tramp Preachers at Crocknacrieve has, so far as the public are aware, been different from its predecessors in some respects, and the change is for the better. Whether there has been really any change of doctrine propounded by the leader, Mr. Irvine, no one knows but those in the inner circle, for he kept himself within his room, and did not speak in public at the Sunday Conventions, though he did in the private class, but one fact was patent—there was no longer condemnation to hell of all who did not follow their ideas, and there was not the same stress laid upon baptism as before—though both of these ideas may be held as tenaciously as before. Condemning the great and good of past and present time freely to hell, and preaching the need of baptism by their methods on avowal of their tenets, were the two chief features of past Conventions. The public recoiled from such ideas, clothed as they were, too, in obnoxious language; and whether it was that the effect of such preaching was found to be unpalatable, and that, therefore, it was discontinued, or not, it has not been so much in evidence, and we are thankful for so much of a return to saner methods. The usual reaction after such religious excitement seems to have set in. The new adherents have been chiefly from abroad, and from the more remote parts of the Empire. Money and means have been found to transport ‘the workers’ about from country to country, and the ordinary country clergyman, settled in a rural parish, working away from year to year, has quite an unenviable time compared to the Tramp Preacher, who has only to fancy himself called to some new sphere of labour, and he is provided with a ticket for Australia, Tasmania, New Brunswick, or Canada, and he gets seeing the world, while ‘working’ to obtain ‘converts; and, apparently, has not a bad time at all. There have been rumours revived of a difference between the leader, Mr. Irvine, and his chief lieutenant, Mr. Edward Cooney; also of some difference in the camp about 10 or 12 days ago, in consequence of which some of the workers left; but whether this rumour be so or not, the outside world is in ignorance, and as the matter is none of theirs, it is not discussed in public. But it appears that everything does not work at Crocknacrieve as smoothly as the commissariat, for if the leader had a strong will, others may have a strong will also. Mr. Irvine looked out of his window at the Conventions, and did not address one public meeting. Mr. Cooney came across the Atlantic in deference to the most urgent representations as to the danger of ‘a split’ being talked of, and that it could only be refuted by his presence at Crocknacrieve. He came, but he did not take a prominent part, leaving it to some young man named George Walker to do the chief part of the speaking. This man made little of education from time to time, or perhaps, to put it more correctly, warned people against attaching too much importance to it, and the reason was obvious. His own addresses showed the want of it, and he seemed to feel painfully conscious that he suffered for want of one quality to enable him to speak as others do. If he does feel this way it is all the more to his credit, as only too many of these men seem ignorant of their own ignorance and want of capacity, and think that by stringing a number of common-place ideas together, with an odd startling ‘shocker,’ that they are competent to preach. It must be conceded to them, though, that they preach morality, and that the effect of their preaching, while it is distressing in breaking up families and spoiling the unity of the home, it does tend to virtue and in many cases to self-denial. If, then, they would cease altogether abusing their neighbours, who are in very many cases better than they are, and set some example of the Christian life by preaching and practising the charity which is enjoined in the New Testament, they would live nearer the life they profess to set up as an example. Apparently Crocknacrieve is to be the Mecca of the Tramp Preachers. It is laid out to provide for accommodation of large numbers, and the experience of each year has enabled them to improve its facilities. These people do not worry over such temporary and rude conveniences; the majority of them have not much better accommodation in their own homes, and there is a pleasurable excitement to them in the meeting of numbers, in associating with one another, and the yearly holiday as many of them make it. But all the precautions in the world will not keep the ‘brothers’ apart from the ‘sisters,’ as they mark different places. Mr. Irvine seems to think that it is the women who tempt the men. Some of the women kind would think otherwise. Commingling is perfectly scriptural, and naturally right, and separation is morally wrong. Anyhow, virtue reigns, and there is not the slightest, not the faintest imputation against the purity of the Convention, but all the rules that ever were made will not prevent men and women from the natural impulses of healthy life, according to the Christian ideal of mating, according to God’s ordinance, and it is right and fitting that they should come together. Some of the ‘Tramps’ have taken up what they call the Adjustment Treatment of disease, and perhaps think that, like medical missionaries, they may make progress if they can cure human ills. The treatment has something to do with the spine, and as the nerve system is supposed to radiate from the spine, so the seat of the nerve system is dealt with. Whether, like Holloway’s and Beecham’s pills, the Adjustment Treatment is intended to cure all or some of the diseases of humanity is not yet known, but the treatment is to be followed and developed. In any case it is not likely to do any harm. The Convention is now over, and it does not appear that the Tramps have made any headway during the past year locally; the movement seems to be rather on the wane locally, but the novelty may attract supporters among the simple-minded in out-of-the-way places abroad for a time. Wm. Irvine, the founder and supreme authority of what is known as Cooneyism, is a Scotchman. His native place is Kilsyth, a small town near Glasgow. Before he became a Tramp he had attached himself to the sect know as the Faith Mission or Pilgrims, and was the manager of a coal mine under Baird & Co., Glasgow, and enjoyed a salary of 300 pounds a year. William Irvine left this employment and joined the Faith Mission, under the control then of J. G. Govan, of Rothsay, who still holds conventions after the manner followed at Crocknacrieve, but on a much smaller scale. It is often addressed by evangelical Clergy. Wm. Irvine gave up his connection with that sect for two reasons, according to my information—1st, because the leader was alleged to have been a ‘hypocrite,’ in that while teaching Pilgrims to live by faith he himself had over hundreds of pounds. 2nd, because Mr. Irvine’s converts always lapsed and were lost among the clergy by going back to their own congregation or what is known as the churches. Consequently a small number of preachers and some from the Faith Mission, along with one named John Long (who was rejected three years ago, because he would not maintain that John Wesley had gone to hell) and about a dozen stood by Wm. Irvine, and they had some difficulty in knowing what to preach as the only true gospel, which same difficulty still exists today and has been the debate of many Conventions, and I suppose is now, and will yet be. However, the chief motive power was latent until Edward Cooney heard Wm. Irvine, and offered him money and even a salary yearly, which was refused by Irvine. At all events 1,300 pounds from Mr. Cooney alone was applied to the cause, and has been preached as having been ‘given to the poor,’ on the authority of, ‘Sell all that ye have, &c.’ Yet as a matter of fact, this sum was mostly paid to transport preachers to places abroad, and not to the poor, as is sometimes understood, the fruit of which even yet in some measure returns annually to Crocknacrieve Convention. Edward Cooney soon made converts, and spoke of his relatives in a manner not after the style of the Gospel. But because of his sincerity and earnestness, many were influenced, and also troubled, especially by other statements. If it be desired to open up the cause in a city, a former convert would get a situation there, and so open the way for a preacher to stay with him, and Matthew X or the 10th chapter of Matthew’s gospel was then claimed to be in force or in practice. If a member professed to follow the Jesus way, an ‘elder’ or ‘bishop’ was ordained or transferred, and all are under his supervision, after the preachers go away. Collection are sometimes made, as in some churches of Scotland, and forwarded to the Apostle, and also money may be sent to any other such preachers by any of the members if they care to do so, but especially to Mr. Edward Cooney and Mr. Wm. Irvine. 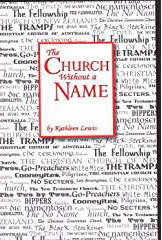 ‘Church,’ it may be added in this sense means a collection of believers. Sometimes a preacher may be nigh starvation, but a post card often affords relief, when sent to one of their own sect, who may have the means. In other cases the poverty of such preachers induces converts to give help. He may supply a bed and food, and consequently are then said to be saved. Yet time only proves whether the conversion be permanent. Change and development of doctrine prevails, and doubt in many cases, even in Mr. Edward Cooney’s and Mr. William Irvine’s cases, which have been confessed openly. For example, most of the converts have been made through meetings in wooden halls, tents, and in some cases organs were used. Many people professed to have been saved before meeting the Tramp Preacher. Now, all these things formerly used by the Tramp Preachers are said to be of the devil. ‘Enquire who is worthy to abide with him’ is the professed order, but one cannot always get hospitality, and to take an empty house or go to lodgings is often the alternative, and human sympathy in some cases supplies the rest. 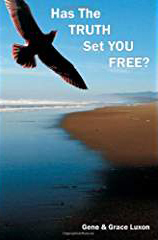 Change of doctrine has made things different for many, especially for those who were not originally converts of Mr. Wm. Irvine or Mr. Edward Cooney, because unless you hear or believe through a Tramp Preacher, they say there can be no possibility of spiritual, divine life, past, present, or future. It is immaterial how definite your aspirations or what quickening towards God may have been wrought in your heart or soul previously. So that in other words, derivative or successive christianity is now re-established via William Irvine and Edward Cooney only. This is all the more remarkable and contradictory since William Irvine has a great difficulty to determine his own spiritual Father, and he professedly the great grandfather of all! Some say it was the Rev. John McNeill; some say Wm. Irvine’s sister was the means of spiritual life to him, and some are not very sure but that since Thomas was a doubting apostle, they are contented to be a brother of his, and some do not trouble much as long as they keep near the dinner hour, and do not fall out with headquarters. Of course one can easily understand such doubts, as Wm. Irvine has always retained his own purse, and says there is no difference between a purse and a pocket. Still there must be a difference between a professor and a true follower of Jesus, or one who professes to follow the teachings of Matt. X. and acts to the contrary, with one who does not profess Matt. X and acts consistently. The remarkable principles of Cooneyism spring from the apparent and even admitted contradictions of the clergy, and may be rightly termed an ‘Anti-Clerical Crusade’ with hell fire behind it, and what you have to do is to feed a preacher or preachers and house them and say ‘the Jesus way is right,’ and then try and make yourself believe you are right, too, and if you wish to be right—sell your house, your home, or your head, and your individual consciousness of God and God’s word and send the proceeds to the Convention, and then become a preacher, and of these so-called preachers there are sometimes as many as 80 volunteers on the list. Yet the terrible heart-breaking and conscience-racking fact remains with many—what if I am not saved after all? What if all this sacrifice and show be no better than Dowyism and Darbyism. Another remarkable feature of doctrine is—The preaching of the blood (of Christ), the death (of Christ), and that the cross of Christ must not be offered to the ungodly, only to those who are supposed saints, who have supposed spiritual life by receiving the supposed preacher. 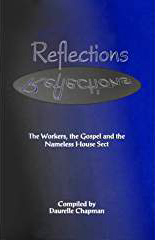 The Ministry of Reconciliation is a secondary thing, or the fact of ‘Jesus who gave Himself a ransom for all as the one mediator between God and men,’ of which Paul was a herald and apostle: that, with the Cooneyites, is but a Pharisaical delusion. Consequently, one can now understand the atmosphere of doubt. Still they proceed on their anti-clerical crusade, and retain the anti-christian formality of no collar, and have professed no purse, and have a voluntary and mock hypocritical humility, which Paul says in Col. II. 18, is being puffed up by the mind of the flesh. As it is a marvel where their money comes from to make a display at Crocknacrieve, it must be recognized that a few rich men are under their power. New candidates for preachers have sometimes a few hundred pounds, and then to shout ‘You will go to hell if you love money’ has a wonderful effect, even on a miser. Yet neither Jesus nor Paul had their annual Convention, neither did they have a system of sending out women as the Cooneyites have done. Paul instead of enticing out the saints to follow Him, as Cooney does, he rather wrought with his hands to be an example to keep many of them at their work. Paul even said he would not use Matthew X. as to ‘living of the gospel,’ and used almost any means he could get to save some (1 Cor. IX); and if one was raised up by God, as Paul was, independent of the twelve, the Cooneyites would have no hesitation on sending him to hell and calling him a child of the devil, especially if he worked with his hands as Paul did, and did not conform to Mr. Cooney’s view. I, William Dennis Wilson, of Cretingham, in the County of Suffolk, Farmer, hereby admit and acknowledge that I have for several months past been printing, publishing, writing and circulating various letters and documents of a libelous nature, reflecting upon your moral character and integrity. I further admit the charges against you contained therein are absolutely untrue and without foundation in fact. 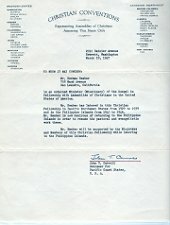 I unreservedly withdraw the same, and request you to accept this Apology and expression of sincere regret for my conduct, and I hereby undertake not to continue or repeat the writing or publication of the same or similar letters and documents in any way referring to you or either of you directly or indirectly, and in consideration of your accepting this apology, I also undertake to pay your legal charges, and also the costs of publishing this apology in such local papers are you may select. AS WITNESS my hand this fourteenth day of October, 1910. Signed by the said William Dennis Wilson in the presence of Leonard Gocher, Solicitor, 83 Colmore Row, Birmingham. We accept the above apology, Chas. T. Partridge, for Self and Wife.